The Witcher 3 is hardly lacking for detail, but textures could always be sharper—rocks rockier, tiles shinier, chests woodwormier. Rocks, spruces, wood crates, sacks, ceramic rooftops and checkered floors are all improved by The Witcher 3 HD Reworked project, now updated to version 2.0 and available to download from The Witcher 3 Nexus. Mod author Halk Hogan PL plans to return to the mod to rework more textures, but is torn between Fallout 4 and The Witcher 3. If you recognise the name, Halk did some great HD texture packs for Skyrim. Check out these lovely mushrooms. Halk reckons the HD pack won't slow down the game too much, though in my experience HD texture packs can affect performance a bit. Sadly I can't try it out as I'm away from a gaming PC, and the rest of the PCG clan has succumbed to a mince-pie-and-meat coma. 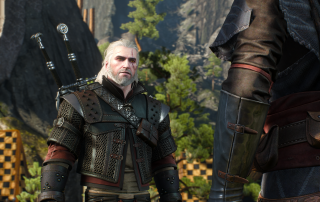 If you've received The Witcher 3 as a gift or want to spruce it up for a languid post-Xmas adventuring session, this could help, as might the many other Witcher 3 mods we've tried out since launch.